Jeep Thrills Wii ~ Are you Hooked? Well I have read both good and bad reviews of this Wii game, some saying it is more for the younger audience, under the age 8 while others are saying that the steering is tricky and best played by a more experienced Wii gamer. The graphics are universally told as pretty good with realistic looking Jeeps and terrain. The game itself offers 18 customizable Jeeps including futuristic concept cars and 35 intense tracks. 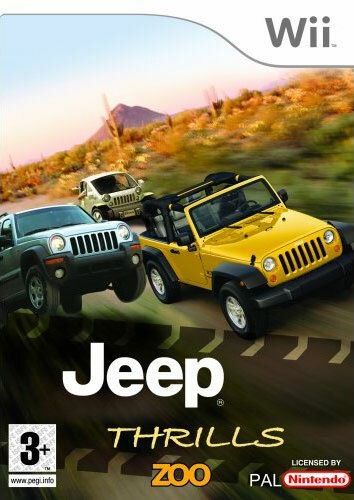 Has anyone out there played Jeep Thrills yet… and if so… what are your thoughts on this game. Looking for adventure, try out Big Jeep Adventure at http://www.jeepbigadventure.com/. There you will get to drive your brand new jeep through eight different levels while collecting required items as quickly as possible. Want to go off road mudding online? Then give Jeep Muddin’ a try at http://www.jarkey.net/playgames/jeep-muddin’_game.htm. Here is your chance to get good and muddy and not have to listen to anyone complain. Play for hours in the mud in Jeep Muddin’s off-road championship racing mud bowl. Grab extra equipment, upgrades, and gadgets to unleash even a more powerful Jeep! Mountain Madness can be found at http://www.jeep.com/games/mountain_madness.html where you will become acquainted with a quiet mountain town that is at risk of being buried under an impending avalanche. Only you and your 2005 Trail Rated Jeep Grand Cherokee can save the town as you work through your missions. . Still craving more jeep off roading adventures, try out Jeep 4×4 Adventure at http://www.net-games.biz/funny-games/Jeep-Adventure.html. There you will find yourself maneuvering through dense jungles while you race your Jeep through treacherous trails. Crave the need to feel like a rescuer in your Jeep, give Jeep Rescue Patrol at http://www.4ugames.net/startgame.aspx?gameid=27 a turn. Play the rescue ranger, rescuing stranded off-roaders leading them to safety while maneuvering around and over treacherous boulders, mud bogs, trees, and streams. Never again will you be on total lock down from having some off roading fun! Well, at least not until you are told to shut the computer down and get to bed!